The religion of the Proto-Saharans is older than the Rig Veda and Torah. Hinduism is not the oldest known world religion. Torah comes much later as an expression of post-exilic Judaism. Comparative linguistics indicates a close connection between the proto-languages that emerged as Elamite and Dravidian. Both share roots found in the proto-languages of the Sahara and Nile Valley. The number six is one example of the relationship of these languages. The number six in Dravidian is caru. This correlates to koro in South Africa; to karkia in some Chadic languages, and to korci in Meidob (eastern Sudan). The Kanembu (Sudan) word for six is araku and the Tamil word is aarru. Other examples of the linguistic connections include: the Hebrew word for salvation - yasuah - corresponds to the Sanskrit words asvah, asuah and yasuah, all meaning salvation. The Sanskrit word for heaven - svah - corresponds to the Semitic svam and to the Proto-Dravidian van. The Hebrew root thr, to be pure, corresponds to the Hausa/Hahm toro, meaning clean, and to the Tamil tiru, meaning holy. All are related to tor, the Proto-Dravidian word for blood. 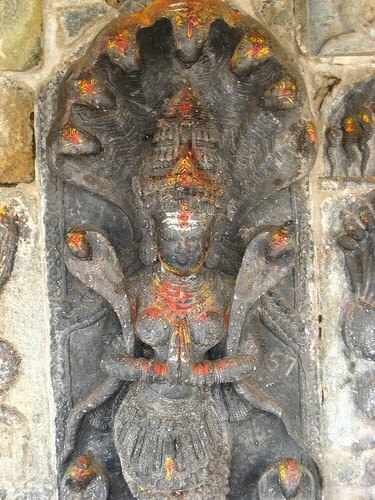 The more primitive elements of Hinduism share a religious tradition that includes ancestor veneration, henotheism, the divine appointment of rulers, a priest caste, animal sacrifice, and veneration of the Sun. The commonality is due to the way these religions developed organically from the archaic religion spread by the ruler-priests who are called "the mighty men of old" in Genesis 6:4. The mighty men of old are also referred to as Anakim and Nephilim. They are called the "sons" of God, and the "powerful ones of old" in Genesis 6:1-4. The word npyl (nephil) in Aramaic means "great one" and is equivalent to nfy in Arabic, meaning hunter. It is said concerning Nimrod that he was a mighty hunter or a mighty man before the Lord. The clue to understanding Genesis 6 is the word gibbor-iym (powerful ones). This passage is speaking about ancient rulers who were regarded as the "sons of the gods" or deified kings (elohiym). The gibbor-iym or elohiym comprise the divine council spoken of in Genesis. This is a common theme among the archaic rulers. The idea spread across the ancient Afro-Asiatic Dominion. In ancient Edom there was a ruler named Anak. His father father was Arba. Hebron was called Kiriath-Arba. He belonged to the Ar clans of Canaan. Dr. Catherine Acholonu connects the Ar of Canaan to the Aro of Nigeria. She writes, "In Nigeria the caste under reference is the Ar/Aro caste of Igbo Eri priest-kings, who were highly militarized in their philosophy." The "mighty men of old" were a ruler caste (clans that practiced endogamy) who spread along mountain chains (high places) of Southern Europe and the Hindu Kush, and they likely controlled commerce through the Pamir Junction. These were aggressive kingdom builders who regarded themselves as divinely appointed to disperse and subdue the earth. Later rulers such as Alexander the Great, Constantine I, held this idea as well. The royal priests traveled as far as Nepal where they are called Harwa, the ancient Egyptian word for priest. These ruler-priests are largely responsible for the diffusion of the Afro-Asiatic religious life that took root around the large water systems from west central Africa to the Indus River Valley. It is a religious life that shares eight features, all of which are found in the Bible and constitute the biblical worldview. Many of these featrues are found in Hinduism also. The ancient high place of Meroe on the Orontes River in Turkey was built on the precipice of Mt. Silpius. The earlier name for this fortress was IO, which means “pillared place dedicated to the Creator.” The O is a solar image. This follows the Kushite practice of naming river shrines for the Sun. Heliopolis on the Nile was called Iunu which means "place of pillars" because it was constructed with many pillars. In ancient times, the Orontes River was called the Draco or the Asi. 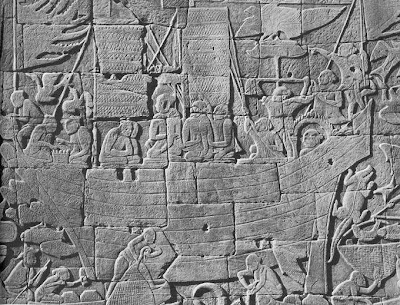 It was the chief river of the Levant and had sufficient depth for boats to sail up the river from the Mediterranean near modern Beirut. This was aided by the north-flowing currents. In ancient texts the ruler-priest caste is known by various related names: Opiru, Hapiru, and Habiru (Hebrew). The number seven was sacred to them because it referred to the seven heavenly bodies which were viewed as ruling the heavens. The Luo (Nilo-Saharan) word for seven is abiriyo. The word abir is a cognate of Habiru (Hebrew). The sacred character of the number seven for the ancient Habiru is evident in Genesis. The seventh day is holy (Gen. 1); Noah is to take seven sets of ritually clean animals onto the ark (Gen. 7:2). In Joshua 6:4, seven priests walk before the Ark of the Covenant, each carrying a ram's horn. The divine appointment of the ancient Habiru is evident in the solar cradle attached to their names. The Canaanite Y is found in the names of these Habiru rulers: Yaktan (Joktan), Yishmael (Ishmael), Yitzak (Isaac), Yosef (Joseph), Yetro (Jethro), Yeshua (Jesus/Joshua), etc. Václav Blažek suggests that Elamite is related to the Afro-Asiatic languages whereas David McAlpin finds a genetic relation between Elamite and Dravidian languages. Both are correct. All are languages of the ancient Afro-Asiatic Dominion which extended from the Nile to the Ganges and spread into ancient Anatolia and Bactria. There are numerous linguistics connections between the people of Africa and the Sudroid. As ancient Afro-Asiatic peoples used base 6 in counting, the number six is a significant indicator of related languages. Consider the following: The number six in Dravidian is caru. This correlates to koro in South Africa; to karkia in some Chadic Languages; and to korci in Meidob (eastern Sudan). The Kanembu (Sudan) word is araku and the Tamil word is aarru. Here are other examples of the linguistic connectedness of these languages. The Hebrew word for salvation - yasuah - corresponds to the Sanskrit words asvah, asuah and yasuah, all meaning salvation. The Sanskrit word for heaven - svah - corresponds to the Semitic svam and to the Proto-Dravidian van. The Hebrew root thr, to be pure, corresponds to the Hausa/Hahm toro, meaning clean, and to the Tamil tiru, meaning holy. All are related to tor, the Proto-Dravidian word for blood. The Elamite word for king is sunki, a cognate of the Hahm/Hamitic sarki, meaning king. The Sumerian word for king is sar. 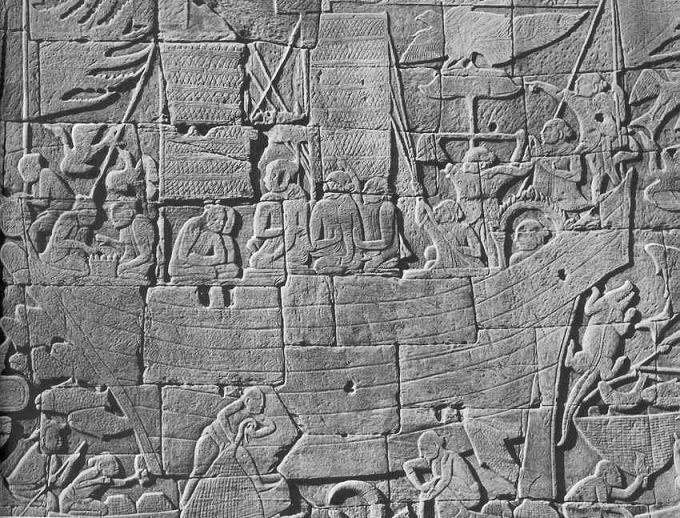 Sar-gon conquered Nippur in 2340 B.C. and established his capital in Akkad. His name means King of Kings. He is said to be the ruler of Kish, which suggests that he might be the biblical ruler Nimrod, the son of Kush. The Chadic word for king is gon lere. 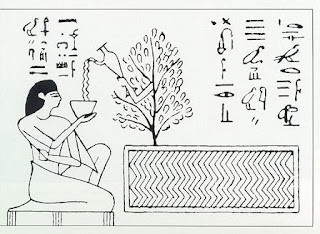 The connection between the religion of the archaic ruler-priests of the Nile and India is evident in shared linguistic roots and in artifacts found in both regions. These include dwarf deities, the lotus symbol, the serpent symbol, Ra's solar boat, and the tree of life symbol. 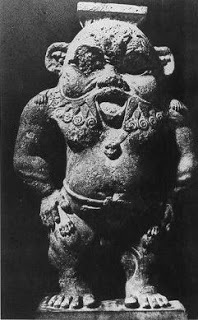 This third century BC image of the African dwarf Bes (above), like the Hindu Yakshah (left), was a patron of wealth in African folklore. His statute appears at the Dendera Temple. In ancient Egypt Bes was venerated as a semi-divine ruler. His name is related to a Nubian word besa, meaning cat. His appearance suggests a cat, perhaps Ra's cat who killed the great water serpent. Some Nilotic dwarfs were people of high status in ancient Egypt. The higher than average incidence of dwarfism appears to be due to the fact that the archaic Nilotic nobles practiced endogamy. A team of Georgetown University Hospital studied biological remains that showed that dwarfism in ancient Egypt was not seen as a handicap. 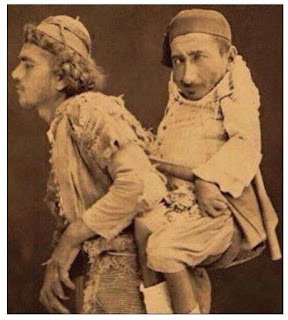 Instead dwarfs were respected individuals. Some dwarfs served as priests. Their stature was not regarded as an obstacle to such service among the archaic rulers. However, by the time of the Jerusalem Temple, it was forbidden for dwarfs to be priests (Leviticus 21:17-20). This statue of the Hindu Yakshah was venerated in the area where remains of giant men were found in 1936 in central Africa at Lake El-yasi. 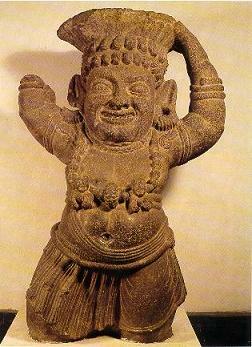 The Sanskrit word yaksha is related to the Kushite word yashi. Solar boats are found wherever the archaic rulers established their territories near water. They point to the Ra-Horus-Hathor narrative. 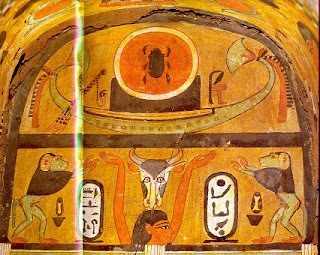 This image from ancient Egypt shows a solar boat over the head of a bull and Horus. The horns of the bull form the image of the sun’s base resting in the celestial boat. The bull is venerated as a sacred symbol in both Africa and India. 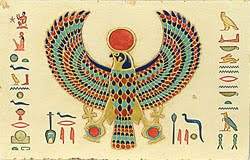 Horus, who was called the "son of God", is often shown with upraised arms or falcon wings with a sun on his head. This overshadowing indicted divine appointment as the King. This solar boat found in India shows the seven deities representing the seven great lights of the heavens. The number seven was regarded as a sacred number among the archaic ruler-priests who were sidereal astronomers. Sidereal astronomy is based on observation of the arrangement and movement of the fixed stars and planets. This science originated among Abraham's Proto-Saharan cattle-herding ancestors who had recorded information about the fixed stars and clock-like motion of the planets and constellations for thousands of years. By 4245 BC, the priests of the Upper Nile had established a calendar based on the appearance of the star Sirius that becomes visible to the naked eye once every 1,461 years. Apparently, Nilotes had been tracking this star and connecting it to seasonal changes and agriculture for thousands of years. This is verified by the priest Manetho who reported in 241 BC that Nilotic Africans had been “star-gazing” as early as 40,000 years ago. The earliest known celestial observations were those of the rock shelter people living in the Lebombo Mountains of Southern Africa. 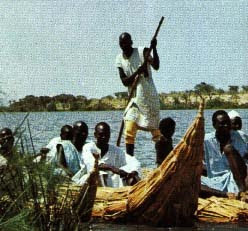 Reed boats are found in Africa, India and Pakistan. They are used in a Hindu religious festival which takes place every year on the banks of the Ganges, when thousands of people burn incense and candles on small reed boats and float them down the river at night. The boats carry their prayers. This carving of a 70,000 year old python stone was found inside a cave in remote hills in the Kalahari Desert of Botswana. It is 20 feet long. The area is known to San (or Bushmen) who live there as the "Mountains of the Gods." The stone has over 300 indentations made by humans to give it the shape of a python. 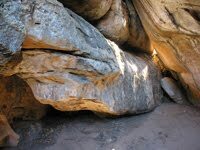 The python appears to have been a sacred symbol for the archaic humans who lived here, so this rock shelter also would have served as a shrine. There are two paintings on one wall of the cave. The Python Stone is about the same age as the oldest known counting device (the Lebombo Bone) and the mining operations in the Lebombo Mountains which involved thousands of miners. All of these finds date to between 80,000 and 70,000 years. India has no serpent images as old as this, although the serpent has been venerated in India for many millennia. Jose Bulang of the Philippines has been tracing his ancestors back to Africa using DNA studies, linguistics and oral tradition. He has written: "My father told me that according to story as told him by his father, his first ancestor who arrived at Dauis, Panglao, Bohol was a big man and long haired who had a big python pet who he used to play with in the sea when he is taking a bath. My father would say that such python is useful in sea travel because the python when placed in the forward side of the boat will always direct his nostril towards the winds and can detect approaching typhon or water turbulence, being restless. And also the snake eats only once and only during full moon that it is useful when navigating for a long period and no star can be seen as guide. This made me realize that the travelers that time were using this Nahash (Ahas in Philippine dialect) as a travel instrument in the river or on the seas." In Igbo tradition (Nigeria) the cosmic serpent is associated with the Christ, and in speaking of his death, Jesus referred to the serpent being lifted high by Moses in the wilderness (Numbers 21:4-9). 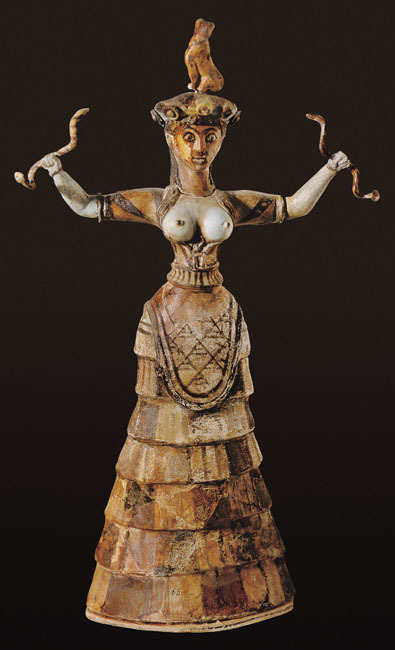 Note the resemblance to the Minoan snake goddess who also holds a snake in each hand. The Tree of Life is very old motif as is evident from its wide diffusion. It is found in Africa, Asia, Australia and South America. In Anthropology, the principle of diffusion states that the oldest culture traits, beliefs or practices are those that are most widely diffused globally. 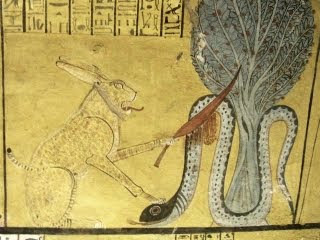 The tree of life archetype is as old as the serpent archetype and the two are often portrayed together, as in the image of Re's cat killing Apophis, the giant water serpent. In Genesis 3 the woman, the tree of life and the serpent are central elements in the narrative of the "Fall" from perfect communion with the Creator. 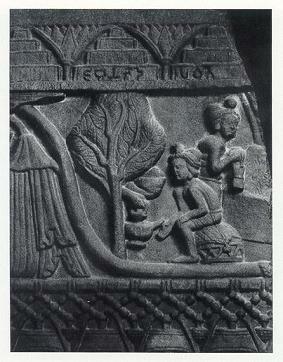 This image of a Hindu tree of life appears with a lotus blossom and a serpent. One of the oldest creation myths of the ancient Egyptians envisioned the first place in the world as a mound emerging from the waters of a universal ocean. Here the first life form was seen as a lily, growing on the peak of the primeval mound. The mound was named Tatjenen, meaning "the emerging land." This parallels the Genesis 1 narrative of the watery deep that covered the earth. Then the Creator's spirit went forth over the waters and established order from chaos. In Hindu and Buddhist mythology the mound that emerged is called Mount Meru. It emerges from the center of the Cosmic Ocean, and the Sun and seven visible planets circle the mountain. Interesting post. There are some intriguing connections between India and Africa. The fifth Avatar of Vishnu is Vamana, a dwarf. There is a Tree mentioned in the Bhagavad Gita, a tree whose roots reach to the Heavens and whose branches go down into the Earth. 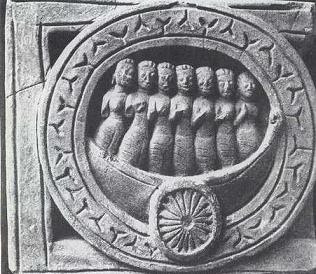 Seven Rishis, or holy men, are mentioned in the Vedas, and are connected in some way (married?) to the six sisters of the Pleiades. And genetic studies indicate that one of the first migrations out of Africa went up through Arabia into southern India. One could, then, argue that Hinduism, insofar as it is a descendant of Dravidian/Sudroid tradition, is thereby African. Greetings, Dharmashaiva. Thanks for the interesting information. The tree of life in Kaballah is also said to have roots in the Earth and reach to the Heavens. I've come to believe that both Judaism and Hinduism are offshoots of a more ancient African religion. This explains the points of contact between those two religions. Tha Rabbis have worked hard to distance Judaism from the religion of Abraham's people. In India Aryan prejudice against the blacks has worked to bury the Sudroid influence. The Theotokos was certainly instrumental in the plan to defeat the cosmic serpent/dragon/devil, but she is not the one who crushed the serpent's head. Gen. 3:15 speaks of her "Seed" as doing that. 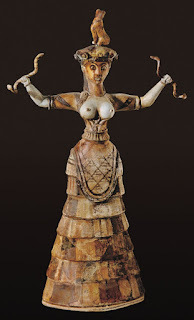 The image of Mary standing on the serpent is from the Latin Church (Roman) and is not found in Eastern Orthodox icons, probably for this reason. MAN invented god and the devil, or what ever names you subscribe to in order to control. Man plays god, man plays satan, man is creator and destroyer on the earth because this is all we know and theres no where else to go. Whatever necessitated this structure had to be pretty bad. That said, the very word "God" references an idea that human beings cannot possibly begin to understand much less define. In scientific terms, if we could all see the distance light traveled in a trillion years, every one of us would still be limited by our common observation point in the bubble of time. Understanding limitless time, space and the energy perpetualy flowing through it all? Thats God. Ray, Anthropologically antecedents and points of origin are significant in tracing culture traits. Such work also involves identifying parallels and distinctions. It simply is not true that "all religions repeat the same point." However, there is evidence that the earliest religious practices of Southern India and Pakistan share many images and concepts with early religions of the Nile Valley, Horn of Africa and Southern Arabia. Many, including myself, reject your dualism and your idea that god is created. That idea is contrary to the very definition of God as the uncreated Creator. The origin of mathematics, metallurgy, astronomy, maritime, agriculture, medicines and social organization, cosmogony originated in Africa. The connections between India and Africa are rooted in these subjects and knowledge. The contacts between Africa and India have been found by the Archaeologists, and perhaps are recorded in the Rig Veda especially the Law of Rita of the cosmos and the society, earth and nature as mother, celebrating fertility. The reason European scholars denigrated other people as they lacked the basic grounds for the development and growth of the culture and to prove the superiority of the white race for colonizing Africa and India they needed racist theories to impose inferiority among our people/ Unfortunately we have been cultivated in the thought process that the knowledge philosophy, democracy, sciences originated in Europe. Western academics have indeed failed to recognize religious and philosophical developments prior to Plato. For example, they never mention that Plato studied under a priest at Memphis for 13 years. They turn a blind eye to Africa, especially. Alice Linsley ,Bipin Bharadwaj and dharmashaiva, etc. (who belive that the african religions are older than hinduism , the age of rigveda based on which they are saying that african religions are older is just the age of the oldest hand written copy of rigveda that was found. Even much more before the age of the copy , the veda was passed on orally from one generation to another without any discrimination. In this way it survives orally for many centuries before the 0 CE. Even I will also believe that african religions and hinduism are interconnected but why couldn't think in other point of view that why wouldn't they be the same? atlest now realize that India gave birth to Science , Maths ,etc. in the ancient time , that we think today that we created them in this modern world. So, therefore I conclude that hinduism is the oldest religion and completely logical in nature. The Rig-Veda, the oldest of the Vedas, does not mention copper. Therefore, is is later than the Chalcolithic Period. Copper is mentioned in the White Yajurveda and in the last of the Vedas, the Atharva-Veda (composed c. 1000). The religion of Abraham's ancestors is older than the Rig-Veda. The oldest copper artifacts date to c. 9000 BC. At that time, Jericho was settled by Natufians, a Nilotic people. All humans have Africa as our point of origin.